Scans the function for allocas and used arguments that are passed through the stack. Definition at line 429 of file AVRFrameLowering.cpp. Definition at line 431 of file AVRFrameLowering.cpp. Definition at line 485 of file AVRFrameLowering.cpp. Definition at line 433 of file AVRFrameLowering.cpp. References llvm::MachineFunction::getFrameInfo(), llvm::MachineFunction::getInfo(), llvm::MachineFrameInfo::getNumFixedObjects(), llvm::MachineFrameInfo::getNumObjects(), llvm::MachineFrameInfo::getObjectIndexEnd(), llvm::MachineFrameInfo::getObjectSize(), llvm::MachineFrameInfo::isFixedObjectIndex(), MI, llvm::AVRMachineFunctionInfo::setHasAllocas(), and llvm::AVRMachineFunctionInfo::setHasStackArgs(). 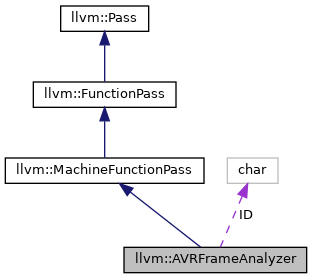 Definition at line 430 of file AVRFrameLowering.cpp.